This month is really racing by. I hope all of you have some sort of handle on your chores, obligations, and other items that need to be completed. Me, I get them done as I need to. I feel like I am always behind, and trying to play catch up. I think, as soon as december is over, I should be ok. But we all know that that isn't true. It will be the start of the new year. So, there are those obligations. Then, I wanted to re-start my virtual card class. I also wanted to get some crafters together to start another stamping class, that focuses on techniques. So, as the days pass, the list of things to get done or at least started grows. Christina, over @ Our Creative Corner, has a delightful challenge for you to try. 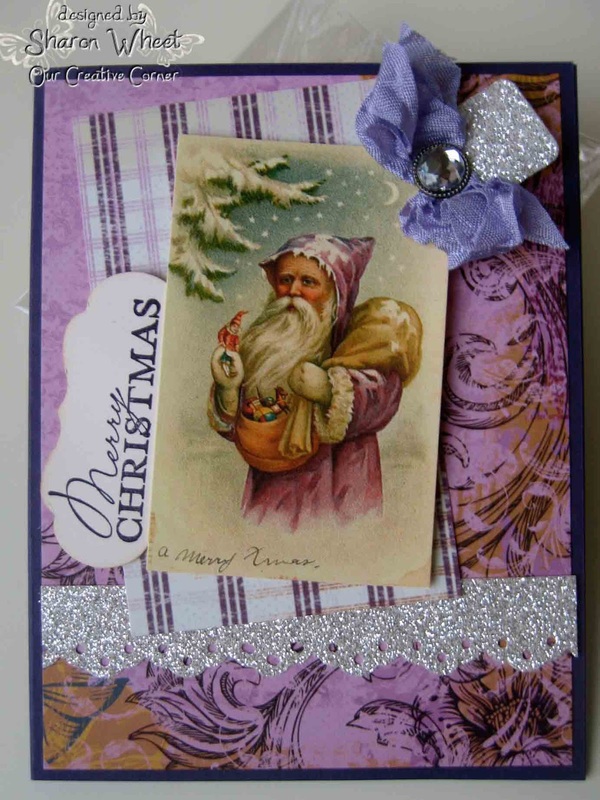 She asks, 'make a last minute Christmas card or project featuring the colors Purple and Silver. You may add other colors, but make sure purple and silver are the focus colors'. Let me start by saying, I struggled with this one. I don't know about you, but there are a few things I can't always wrap my head around. I struggle with Purple and Orange, when crafting. I also have some difficulty with some of Tim Holtz techniques. Now, don't get me wrong, I'm a super fan of TH. But, I just don't think like that. He is super talented and does stuff that I can't figure out how he thinks of this stuff. Now, as with purple and orange. I really struggle with these two colors. They aren't ugly, I just get a mental block. I started with one of the only purple pattern papers I have, from Dreamscape. (Yes, I had one sheet that had a piece missing from a special request.) The card stock is Elegant Eggplant by Stampin' Up!. The sentiment tag is from a die set, Lots of Tags, by Stampin' Up!. As well as the sentiment and the ink I used to stamp it. The Santa in a purple robe was a digital download. The purple striped pattern paper is the reverse side of the purple flourish pattern paper. The silver glitter paper is from Stampin' Up!. I used the eyelet border punch to create the scallops. The purple crinkled seam binding is a small scrap I found in my ribbon stash. The rhinestone brad is from Recollections. I was going to add a bit more, and matt the santa image, but the challenge is to make something 'last minute' so to me that means quick and easy. I can easily spend 2 hours making a single card. But, that isn't last minute. I hope you play along with us this week @ Our Creative Corner. We would love to see what you create. I know you're pretty clever, and hopefully you won't struggle as much as I did. I hope you have been inspired. The design team has created some wonderfully gorgeous paper crafts. You should stop on over, and take a look. You just might be making a last minute purple and silver Christmas craft! Here you are relaying a story that is almost identical to mine; the colour palette. As like me we created through our talent I might suggest wonderful cards that should inspire a few. I happen to love yours, that Santa image is fantastic. That Santa is purple is one snazzy dude! Gorgeous...love all the extra purple pops as well! I am a new follower. Just wanted to let you know I think you did a terrific job with your purple card!! I just LOVE the Santa! Gorgeous card Sharon! 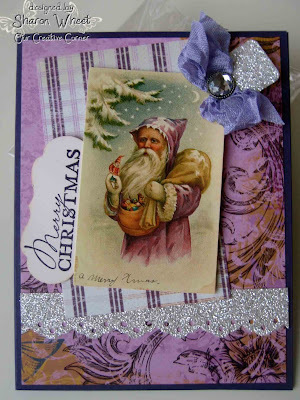 Love your Santa image and you combined the different shades of purple beautifully.